We are very pleased to announce the inclusion of the Vermont Plat House on a House Tour of Modern Vermont Houses. 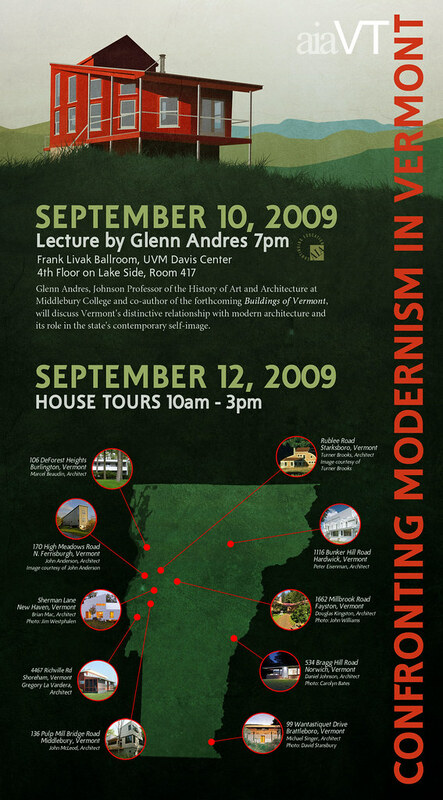 The tour is part of a program organized the the Vermont Chapter of the American Institute of Architects, and includes a lecture on September 10th at Middlebury College, and the House Tours on September 12th which are literally all over the state. Its a fairly ambitious tour agenda as some of the houses are quite far apart! The bulk of the houses are nearby Middlebury College however, and its bound to be full of wonderful scenery and nice country drives. We are very honored to be included on the tour which includes works by some well renowned architects such as Peter Eisenman and Turner Brooks, a long time favorite of mine. The full event poster is presented below. Clicking through will take you to our Flckr page where you can access larger copies if you wish.